With Centifolia Neutral Henna Powder, it brings volume, suppleness and softness to your hair ! 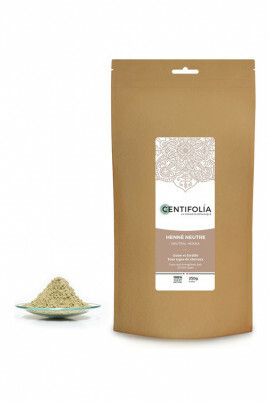 The CENTIFOLIA 100% Pure Henna Powder is a real hair care product ! In a large bowl, gradually add tempered water to the henna powder to obtain a relatively thick paste. Do not use metal utensils. Apply the wick by wick mixture in a thick layer on washed or unwashed hair. When the hair is well impregnated, wrap it in a plastic wrap and leave it on. The exposure time varies greatly depending on the porosity, hair colour and desired result (from 1 hour to 12 hours). Then rinse the hair thoroughly until all residues are removed. On fine, sensitized and dry hair, it is advisable to add 1 to 2 tablespoons of organic vegetable oil (Ricin, Coco, Argan) or lightly melted shea butter to your mixture because henna can slightly dry the hair fiber. Do not apply henna or dye powder to hair that has been chemically coloured or permed for less than 2 months. Before colouring, make a Detox Mask. Protect the areas of your skin that may be colored by henna or dye powder by applying a thick layer of moisturizer or vegetable oil (top of the forehead, around the ears). Wear gloves when preparing and applying the mixture to avoid colouring your hands. Do not use metal utensils to mix henna to avoid altering the quality of the powder. Be careful, the material used could remain coloured. Test on a non-visible strand before applying all the colouring. Wait 24 hours before you see the final result. Do not make any permanent or chemical colouring after a natural henna colouring less than 2 months old. Neutral henna does not colour the hair but, in very rare cases, on very light hair and on gray hair, it can colour them slightly. To avoid this, do not exceed 30 minutes of installation time and space out applications every 2 weeks. 100% pure and vegetable powder.